Paul “Paparazzi” Jones & Justin Jones | Photo © Paul “Paparazzi” Jones — Top Rank’s October 4th fight card at the Bally’s Event Center in Atlantic City, New Jersey featured Glen Tapia’s (22-1, 14 KOs) demolition of Donatas Bondorovas (18-6-1, 6 KOs). However, a small gadget featured on the undercard could change the way we experience the sport. 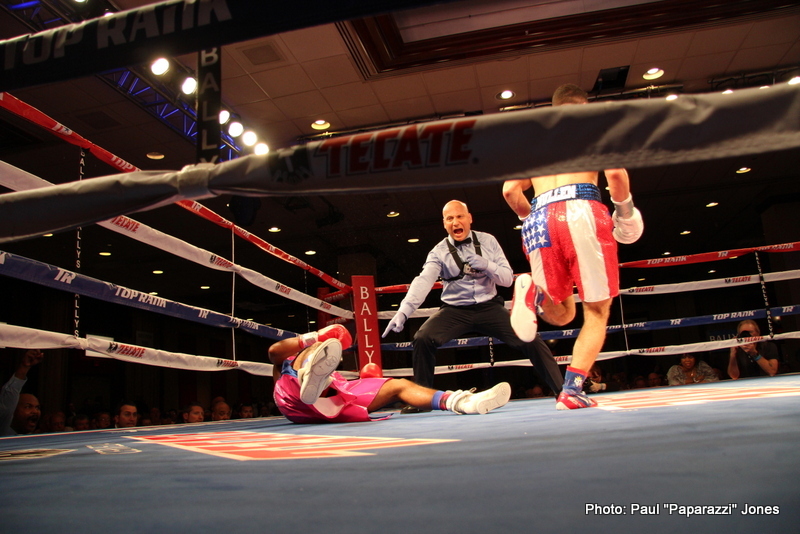 Indeed, it appears that professional boxing is flirting with GoPro technology. GoPro, Inc., the electronics corporation based in San Mateo, California, is among the vanguard in producing high-quality photo and video capture devices. The brainchild of billionaire, Nick Woodman, the GoPro has recorded everything from hiking to extreme sports and it has become a permanent fixture in ESPN’s X Games. 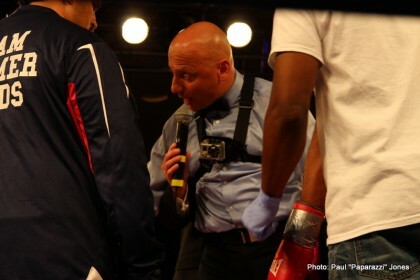 To our knowledge, however, referee Ricardo Vera’s donning of the GoPro Chesty was perhaps the first time that a boxing Commissioner cleared an official to wear the device. Though Vera only wore the device during the bout between Julian Rodriguez (6-0, 5 KOs) and Christian Steele (4-11-2, 1 KOs), he was unclear about its purpose and long-term use. We reached out to The Press of Atlantic City for comment and learned that they are exploring ways to use the GoPro in boxing including fighter safety. Further details will be available on their Boxing/MMA webpage in early November. We believe that using this device may also signal an evolution in the way that viewers experience a boxing match. For instance, imagine watching a heated exchange between fighters from mere inches away. This kind of coverage could quickly become commonplace in boxing telecasts. In addition, having an extra set of electronic eyes could assist referees in making accurate judgments during a fight, greatly reducing the likelihood of a botched low blow or knockdown call. Furthermore, the GoPro can help in determining whether a referee is meeting performance standards. For example, data from this gadget could supplement the metrics used by licensing boards and be useful in referee training. The ways in which the device compromises fighter safety warrants consideration, however. When asked about this issue, Vera suggested that we wait and see. 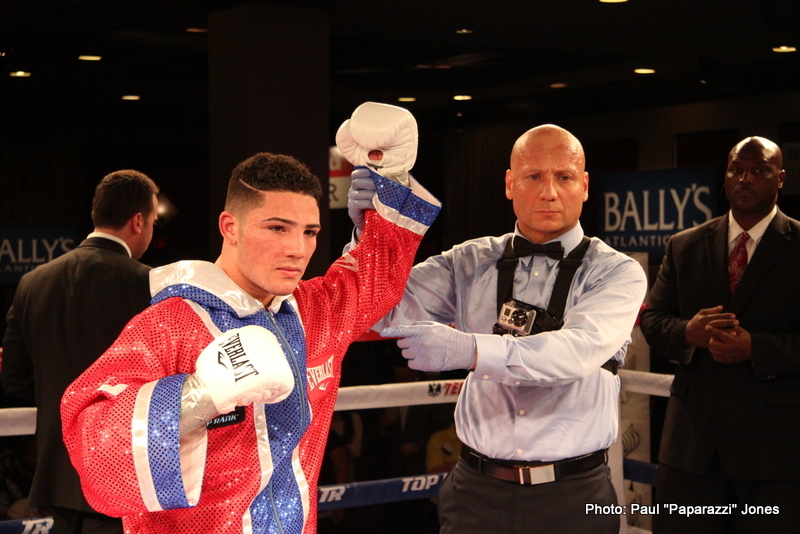 Glen “Jersey Boy” Tapia Tames Bondorovas in AC — Hart, Zewski, Reed, More! Mike “Yes Indeed” Reed Vows to Impress in His Top Rank Debut — Glen Tapia, More! OPEN MIC: Peter “Kid Chocolate” Quillin Discusses Golovkin, Mayweather Jr., Stevens, and More! “The Alien” vs. “Superman” Coming Soon to a Theatre Near You?